This conceptual design drawing is for illustrative purposes only. It shows an example of how the North Campus Conditional Use Permit (CUP) can facilitate an enhanced, restored, and active riverfront supporting educational, research, recreational, and community activities. It communicates the university’s intent and is one of many options for meeting the university’s needs and connecting people to the Willamette River that could be possible within the framework of the CUP. The area of campus within the Riverfront Park Special Area Zone requires a new Master Site Plan as part of a land use application process with the City of Eugene. Called "North Campus" for the purposes of the land use application, the area is approximately 77 acres north of Franklin Boulevard and does not have a current Conditional Use Permit. The previous Conditional Use Permit was in place from 1988 to 2012. It is expired; therefore, a new permit is needed. This land use application, resulting from city code requirements, is necessary to allow the university to address future land use needs and opportunities. The University of Oregon began the North Campus Conditional Use Permit Project late June 2017 with the assistance of landscape architecture and planning firm Cameron McCarthy. The purpose of the project is to complete a land use application package for City approval, so that the university may improve and develop its land for its needs as opportunities arise. The Master Site Plan, the key component of the land use application, uses the concepts of the Framework Vision Project as a basis while meeting the requirements of the city land use code. 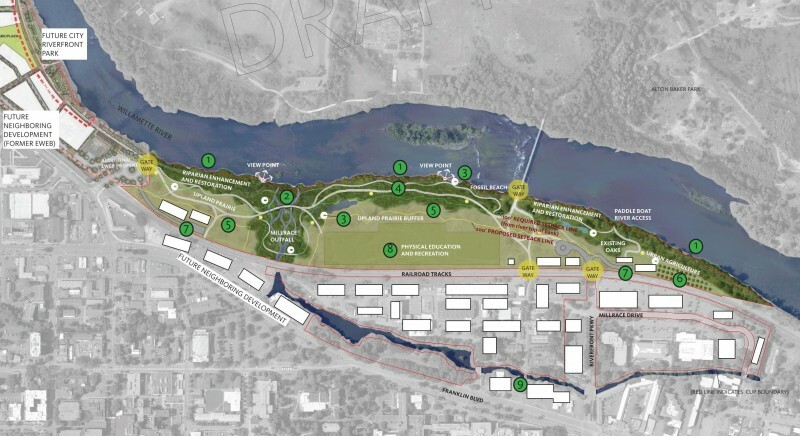 A Conceptual Study of the university’s land between the railroad tracks and the Willamette River (to inform the master site plan), using the Framework Vision Project as a basis. A Master Site Plan for North Campus (delineated by the S-RP zone boundary), meeting the requirements of the City of Eugene land use code and using the Framework Vision Project as a basis. A land use application package for City of Eugene approval through the Conditional Use Permit process and concurrent applications. The North Campus Conditional Use Permit application was submitted to the City of Eugene on February 26, 2018. The City deemed the application complete on July 17, 2018. A public hearing with the City of Eugene Hearings Official was held on September 12, 2018, and the public record was held open for 21 days following the hearing. The university received the Hearings Official's approval on October 31, 2018, and the City's appeal period is anticipated to end November 13. Dedicates land between the railroad tracks and Willamette River primarily to conservation and open space. Concentrates most of the potential building development south of the railroad tracks. Establishes a 200-foot development setback from the river top of bank; twice what city code requires. Dedicates 31 acres of the total 77 acres to conservation in addition to other open space (including 25 acres to conservation continuously along the river). Establishes building coverage and heights well below city code allowances. Improves pedestrian and bicycle connectivity, and proposes no new through-roads. Allows the addition of one new recreation field for a total of three fields. Locates them further away from the river and commits to mitigating stormwater and lighting impacts if they are built. Addresses key interests in bicycle and pedestrian connectivity, river access, riparian restoration, safety, and active uses. 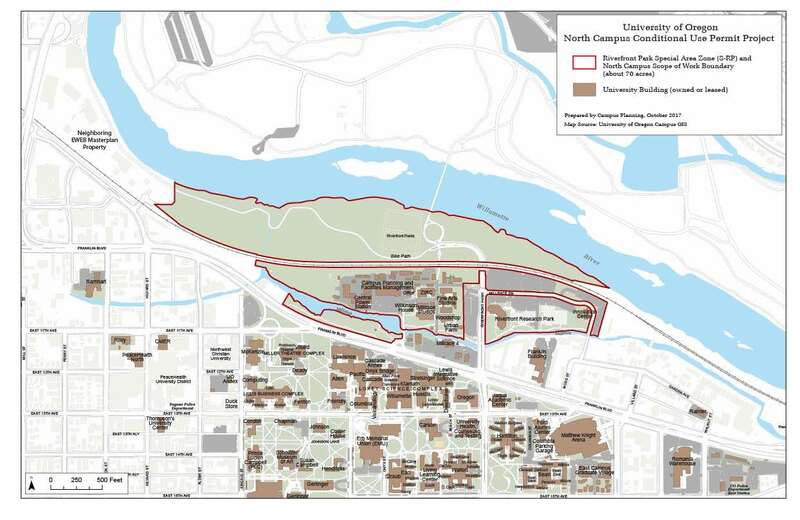 The Master Site Plan is based on the Framework Vision Project (an 18-month-long planning study that was landscape-focused and explored how the university could accommodate growth on campus), a Conceptual Study of the university’s land between the railroad tracks and the Willamette River, and the land use code requirements for the Conditional Use Permit. It has been informed by feedback from university and community stakeholders gathered through public outreach. Campus Planning is the university’s main point of contact for the project, managing the university's process and outreach. The consultant, Cameron McCarthy, is managing the work required for the land use application. The consultant worked with Campus Planning and key stakeholders to develop the Master Site Plan. Cogito Partners was on the consultant’s team and managed community outreach outside the university through the Master Site Plan development. Who Has Been Involved in the Project? The proposed CUP application is the result of a three-year planning effort, starting with the Framework Vision Project to study campus-wide needs. One year prior to beginning the CUP project, Campus Planning met with key stakeholders to understand the scope of the project. The public process for the CUP project started in July 2017. The project gathered feedback and input from stakeholders, interested parties, and the community throughout the duration of the project to inform the Conceptual Study and development of the Master Site Plan. The project engaged both internal and external groups, with internal efforts focused on faculty, staff, students, and administrators representing key areas of interest and external efforts focused on community leaders, business leaders, city and agency representatives, neighboring property owners, river and ecology advocates, neighborhood associations, and other interested parties. Eight focus group meetings (five internal, two external, and one combined internal/external). Two public open houses (November 2017 and January 2018). Two neighborhood meetings (November 2017 and January 2018). Information-sharing meetings with internal and external stakeholders and interested parties (ongoing). Individual interviews with community members representing key interests. Five Campus Planning Committee meetings (all open to the public). Five e-updates to an e-mail list of interested parties (ongoing). Five e-updates to the community stakeholder focus group (ongoing). Three updates in Around-the-O (ongoing). Sharing information on the project web page (ongoing), including open house materials and providing a function for public comment during the open houses. Feedback from the wider community was primarily gathered during November and January, during which the university held public open houses and neighborhood meetings. If you would like more information or have any questions or concerns, feel free to contact Campus Planning directly (Emily Eng, eeng@uoregon.edu, (541) 346-5606). Project updates will be primarily shared through Around the O. You may also request to be on an e-mail distribution list to receive updates. Unlike the majority of campus, which is in the Public Land Zone, the entire North Campus area (delineated by the S-RP zone) needs a Conditional Use Permit in order for any development to occur. As mentioned, the previous Conditional Use Permit is expired; therefore, a new permit is needed. However, this is not a typical Conditional Use Permit application. It is not for a site-specific known development; rather, it is for a vast area of land for most of which the university has no definitive plans and/or funding to improve yet. The timeframe for this Conditional Use Permit will be at least twenty years. This long-term Conditional Use Permit is required because of the area's unique and special location along the Willamette River. Locating new buildings in places that are inappropriate for those building types (such as an administrative building in areas of campus that are reserved for classrooms or student services). Building in designated open spaces. Having to purchase adjacent land and build in neighboring areas with potential negative impacts to neighbors. Further spreading university uses off-campus. Having limited or no options for surge or replacement space, which will become all the more necessary as the university builds and improves research facilities and offices for current and new tenure-track faculty. Not being able to attract new faculty and students due to the inability to provide essential facilities. Keeping North Campus in a situation where areas continue to be unsafe and an eyesore. Remaining isolated from the Willamette River, UO’s most underappreciated natural asset. Connecting to the river will open opportunities for research, teaching outdoors, recreation, improving the ecology of the river’s edge, and improving pedestrian and bicycle connectivity. Note: Please see materials for the Nov 28 Campus Planning Committee meeting and Nov 8 Open House (below) for additional background information, including presentations and conceptual study.